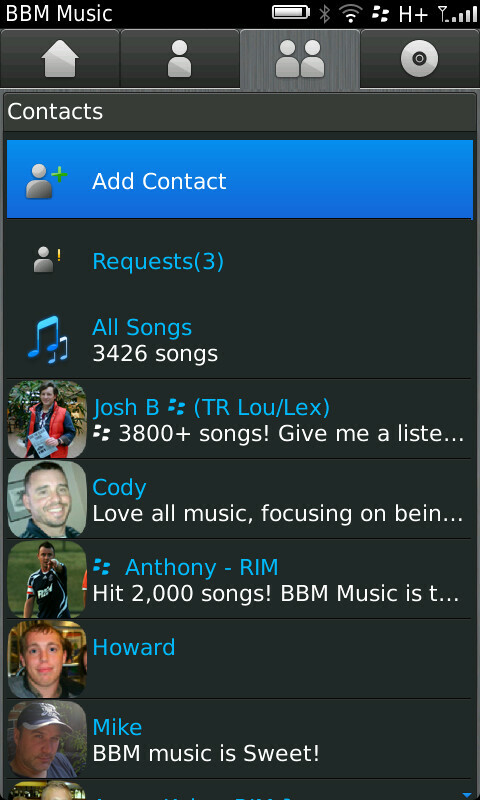 BBM Music...and why I think it's awesome! It seems as though not a day goes by where we open a newspaper, watch the news on TV or view a website with another "doom and gloom" article about RIM: how they are losing market share in North America, how their stock price has dropped or how their devices just aren't up to date. It has become quite disheartening for die hard fans like myself to constantly hear bad things about a device that you love! Now, it would appear that things are on the upturn. RIM's stock price is up, thanks in large part to the new devices released with upgraded processors and running the latest OS-7. Having just received my new BlackBerry 9860 and with my wife using her new 9900, I can tell you these new devices (and OS) are pretty darn sweet! A few weeks ago RIM announced a new music service which ties in to their strongest product: BBM. The premise is simple: use BBM to share music of all types (for a nominal monthly fee). The blog world erupted with the typical anti-RIM sentiment once again. It was said by almost all bloggers that the service was too expensive, a 50 song limit was unheard of and ridiculously small, BLAH BLAH BLAH! BBM Music is currently in a closed beta test, but you can read about it here. Members of BlackBerry Beta Zone can request to test it or can be invited by a friend who is currently testing it. Once installed, you basically choose 50 songs you like and want to share (this is a lot harder than it sounds). These songs are "in the cloud" NOT on your device. Although once you choose songs they will be cached on your device. I chose some old school funk/rap/R&B from the 70's and 80's as my songs. I was amazed at the selection of songs (considering the age of the music I was looking for). I then invited some friends to share my songs via BBM. Now I know what you're thinking...so I'm supposed to pay for 50 songs and then share them with my friends? But I don't have that many friends that have BBM. This is the cool part! There is a section on BBM Music that shows recent updates (similar to what you have inside BBM). As your contacts add more contacts, you just add them too. Each person you add adds 50 songs to your available playlist. 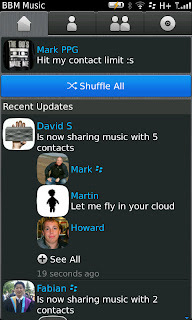 Even better, you don't have to add these people on BBM, only on BBM Music. You can even block people from trying to add you to BBM if you choose. 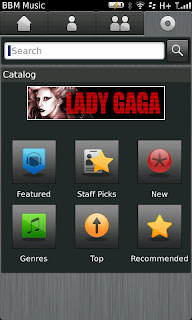 Inside the app itself, you can search for songs, comment on songs, create playlists and even share those songs or playlists via email, BBM, BBM groups etc. Very cool and very social. You can block a song you don't like and delete people entirely if you don't like their tastes in music. Now you still may not see why I think this could work ... Most people get hung up on two things: the cost and the 50 song limit. Lets look at both of these items separately. Cost: The price will be (subject to change) $4.95/month. To me, this service is similar to satellite radio. No commercials, no interruptions and access to more songs than you ever imagined. I pay almost $10/month for satellite radio IN MY CAR. The only other place I can listen to it is online when I'm in front of my computer. This is half the cost, and on my BlackBerry, which is with me 24/7. 50 song limit: STOP! Just STOP! This kills me, because it's all about interpretation. Sure YOU can only choose 50 songs, but so can all your friends. I'm sure the 50 song limit was created by the record companies, and if I'm being honest, creates the whole fun of the app. You HAVE to share your songs with other people to get a decent amount of songs. So if you have 145 contacts (like I do) that can equal 7250 songs. That's a lot more than I currently have on my 32 gig memory card. It also brings something that I bet most of us don't have much of on our phones...variety! Let's face facts, if you don't like a certain genre of music, you won't download it, never mind pay for it! This way you don't have to! But you get to listen to music that you usually wouldn't, and you never know, you might actually like it! If you don't, just block the song or the contact entirely. If you do like a song, share it with your BBM friends. All your current friends songs are also cached on your BlackBerry as well as your own for offline (no network) listening too. Where can I see this going? Well for starters, a contact inside a BBM group I have (Thanks Sahil) suggested that radio stations join the service. They can update their Top 50 songs and share them with listeners. Every radio station has an online presence and almost all have a "listen online" option. This would take the experience to a whole new level! Imagine radio stations advertising their Top 50 tracks. It sure would make it easy to know what radio stations you prefer to listen to. Now look at it from a record company's perspective. Create an account to share new artists of any or all genres... Brilliant! Anyone in the music business can find a use for such a service...and all for only the cost of a BlackBerry and $4.95/month. To the people that say it won't work? I say this: There are currently "only" 100,000 members in the BlackBerry Beta Zone, not all of which even have access to this beta, plus some RIM staff also testing. So the current test group is pretty small. Most of my contacts LOVE the program. I'm sure there will be quite a few who will choose not to pay the monthly fee, BUT, BBM has over 50,000,000 active users and that number is growing by the month. Even if only a small percentage of people join, there will still be more than enough people to make it work. I personally think that it will be a much larger percentage! What improvements could be made? As with any beta program, there is room for improvement. One thing I would like to see is the ability to browse a contact's music PRIOR to adding them to your list. It would just save me from deleting them later if I don't like their music. A PC/Web based version of the program to allow us to listen on our computers and PlayBooks would be awesome. The ability for the program to include any music already on our existing memory cards would be great too. One other thing that I find VERY odd is a lack of ability to "show what I'm listening to" like in BBM. There should be a tag line to promote the service. Something like "I'm listening to xxxxx by xxxxx via BBM Music". The only other issue I currently have is that there seems to be a contact list limit. I'm really hoping that this is just for the beta test and not permanent. Payment abilities are still up in the air. I'm hoping that the monthly fee will be able to be added to your phone bill because I can see a PayPal only payment system hindering the app enormously. One other question mark currently is data consumption. BlackBerry carriers have a very wide variety of data packages available, from huge unlimited packages to the teen oriented social packages, some of which do not include any browsing capabilities. How will BlackBerry and RIM get around that? I guess time will tell.